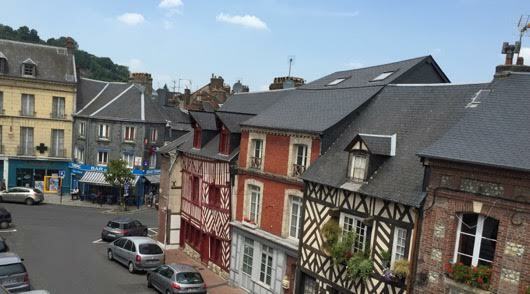 Just arrived in Honfleur! It’s easy to see why the Impressionist painters loved it here. Between the ancient architecture and gorgeous light, I’m inspired too. This seaside town is located along the Seine at the point where it meets the ocean. 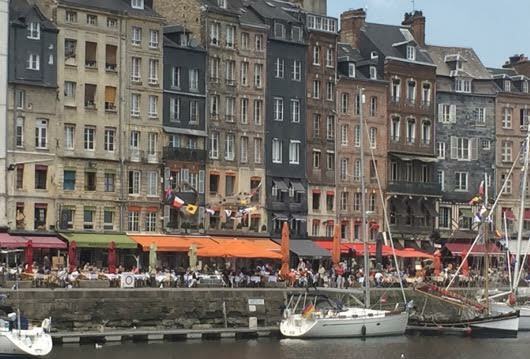 Honfleur is tiny; the tourism board says the population is only 8,500. But 3.5 million people visit annually to take in more than 1,000 years of French political, cultural and military history. The seafood is supposed to be pretty good too. And of course, there are many ways that Honfleur charms artists. Thankfully, the interior has been recently renovated! And I have my own kitchen! The fridge is stocked with apples and veggies. To maximize my cooking workspace, I cleared the counter of the microwave and coffee machine, hiding them behind the couch. All my paint supplies are organized on the dining room table. Now I feel prepared to carry on with our 10-day creativity boot camp led by Frank O’Caine. Frank says that painting is about figuring out your own psychology, how you operate. Through the trials of Giverny, I learned that I usually paint from the center or left of center, which is interesting. I also tend to leave the four corners blank — which is a total waste of space. Corners that contain elements help keep the viewer engaged. The key to a memorable creation is contrast. We have to offer our audience contrasting components that interact with each other. That’s creative energy. In creating contrasting elements in a painting, Frank explained that contrast is different for each artist. The way you contrast and what you contrast is your way of exposing yourself. From here, we get to the whole point of being an artist. Contrast! Absolutely. That is the key to writing humor, among other things. The apartment is cute. 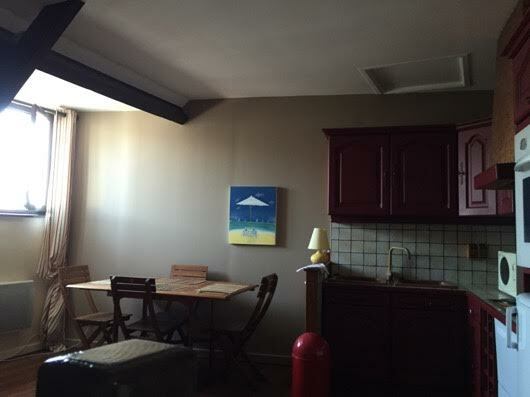 A few years ago, Husband Mike & I rented an apartment in Paris for a month. It was so much more fun and way less expensive than a hotel. We got to feel like a part of the neighborhood. There was a baker downstairs and I’d be at his shop at 7 AM sharp for a loaf of 7 seed bread hot from the oven, for breakfast with lots of farm fresh French butter, bought from a local street market. Just catching up with your previous posts from this trip. I love reading the travel blogs of friends (even happy to sit for slide shows! ), so I’m thanking You for posting. Barb, I’m flattered that you’re reading this. Thanks so much for sharing in my journey. And yes, this is a huge personal journey for me. I’ll explain why in the next post, which I’ll start writing in a sec. Thank you Betty for this inspiring post. I wish i were there too, having Frank coax me out of hiding into the gorgeous light. That exposure element hits home in the deepest way. Good to remember when every painting session (for me) begins with hours of struggling to loosen up. Maybe that’s most of what’s going on. A helpful thought. Jean, I’m glad this post vibed with you. Just got back in for the night and about to blog. Wait to you hear about today. Talk about hiding — Frank had a very personal message for me during the afternoon critique of our work. Give me a few hours and the post will be the next one up on this site.